Children from all over my neighborhood call to request a batch of these amazingly gooey cinnamon buns. I use a separate bread machine for dairy recipes. If you dont, you can use nondairy creamer in place of the milk in the dough. Obviously the rest of the recipe will remain dairy, but your bread machine will stay parve. You can also make the dough by hand if you dont own a bread machine. Credit for this recipe goes to the allrecipes.com website. Place the milk, eggs, melted margarine, flour, salt, sugar, and yeast in the pan of the bread machine in the order recommended by the manufacturer. Select dough cycle. Press start. After the dough has doubled or the cycle is complete, turn it out onto a lightly floured surface; cover and let rest for 10 minutes. Roll the dough into a 16- by 21-inch rectangle. Spread the dough with the 1?3 cup butter and sprinkle with the brown sugar/cinnamon mixture. Starting with the long side of the rectangle, roll up the dough. Cut into 12-14 slices. Place the rolls in a lightly greased 9- by 13-inch baking pan. Its okay if it doesnt fill the pan, the rolls will expand. Cover and let rise until nearly doubled, about 30 minutes. Preheat oven to 400 degrees. Bake the rolls about 15 minutes or until golden brown. In a mixing bowl, beat the cream cheese, 1?4 cup butter, confectioners sugar, vanilla, and salt. 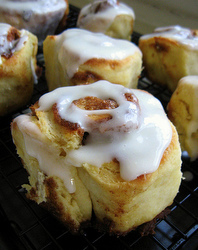 While the rolls are still warm and in the pan, frost them with the glaze.